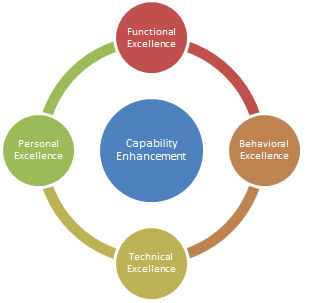 Across industry verticals, irrespective of the size, scale or operations, organizations have realized the impact that structured capability enhancement programs can have on the success of execution of their business strategy. Capability enhancement initiatives at Ester are weaved around a comprehensive framework with Ester’s business strategy at its core. Our employee development initiatives are designed with the aim of providing our employees a platform for their holistic development so that they are well equipped to face impending business challenges and deliver desired results. Esterian DNA is a set of ten ‘business critical’ behavioral competencies that energizes and drives every Esterian. It fuels us to set challenging targets and at the same time empowers us to achieve the same; and thereby it creates a high performance work culture at Ester. It is our belief that by imbibing these competencies, as though these are a part of our DNA, we can effectively catalyze organization’s success and thereby our individual success. Talent Management is an on-going process at Ester and is weaved around two structured programs – High Potential Employee and Succession Management. These programs guide us to identify and nurture our employees’ potential and further developing them for future leadership roles within the organization. Learning and Development Framework is another comprehensively defined and well established platform of overall Capability Enhancement strategy at Ester. The L&D framework provides various opportunities to our employees to continuously hone their skills and grow as a professional.